My shift to atheism got a boost when I was in seminary. Classes in theology especially stirred up doubts—the last thing that was supposed to happen. The Ecclesiastical-Academic Complex (as Hector Avalos puts it) exists to manufacture clergy, those legions of preacher-apologists who can help folks in the pews outmaneuver their doubts. But in my coursework I discovered that theology was longwinded on what God was like, but short of breath on epistemology: where can we find reliable, verifiable data about God? Well, that was asking too much: “We rely on prayer, revelation, intuition, the holy spirit speaking to us.” Really? You expect to get away with that forever? Not too long into my seminary career I wrote an essay, not as a course requirement, but just to get a few of my thoughts down on paper. I titled this little slice of heresy, On the Improbability of God. The main thrust of the piece was the hubris of Earth-bound theology—in the face of our total isolation in the Cosmos. There might be thinkers “out there” who have been probing the Cosmos many thousands of years longer than we have been, and probably know a lot more than we do. We take our theology so seriously, but it is based on…what? I showed my essay to just one of my trusted classmates. He was not amused, and accused me of “scientism.” By no means, however, had I argued that science is so much better than theology; my main point was that we know so little—at this point in the human adventure. Maybe someday science will extend our reach, to find other thinkers “out there.” I also realized that “God has told us” begs far too many questions. Once away from seminary—and the ministry—I had time and opportunity to indulge my interest in science history. I came to appreciate that, indeed, scientism delivers far more data and truth than theology. Humanity has been on an adventure fueled by curiosity that theology could not smother. This endeavor is summed up so well by Timothy Ferris’ brilliant 1988 book, Coming of Age in the Milky Way. We’ve come a long way, coming of age, by paying less and less attention to theologians. But theology, the least reliable way to find out anything, is not about to retreat and retire. The Ecclesiastical-Academic Complex is a juggernaut. Nonetheless, Sam Harris’ blunt smack down—i.e., that “theology must now be considered a branch of human ignorance”—is an incontrovertible principle. And we owe a huge debt of gratitude to the serious thinkers who help outmaneuver theology by communicating the findings of science to the general public. One of these was Victor J. Stenger (1935-2014), whose output can be found here. 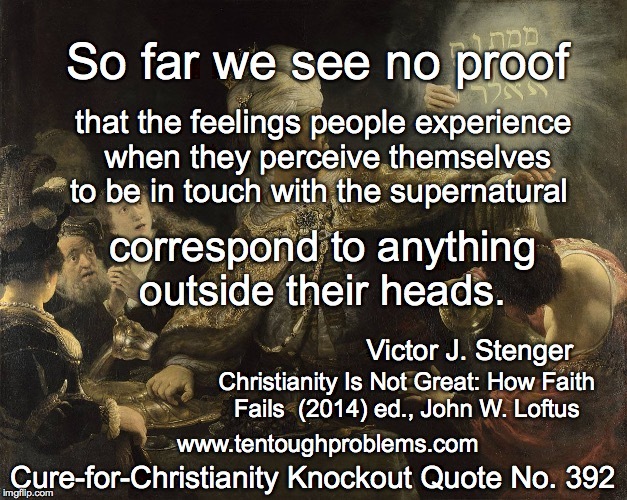 One of Stenger’s last essays, “The Folly of Faith: The Incompatibility of Science and Christianity,” is included in John Loftus’ 2014 anthology, Christianity Is Not Great: How Faith Fails. 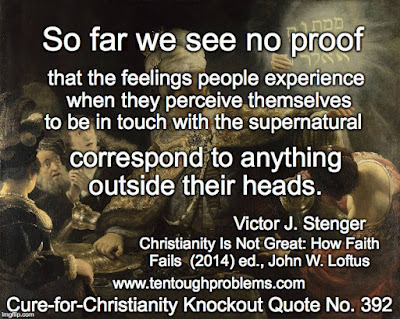 Stenger’s 2012 book was titled, God and the Folly of Faith: The Incompatibility of Science and Religion, but in the Loftus anthology the subtitle takes more precise aim: The Incompatibility of Science and Christianity. This is an appropriate revision, in light of the intensified hostility from the Christ fanatics who are pushing back with full vigor, as Stenger describes in the last five pages of this essay. More on that shortly. It’s a favorite face-saving, faith-saving tactic of theists who “accept” evolution, that God uses the mechanism of natural selection to keep his purposeful creation rolling along. But do these 'enlightened' theists really want to argue that the random mutations that drive evolution are God’s handiwork? If God is an interventionist to that degree, he is open to the charge of massive neglect on so many levels. This feint hardly seems worth it. And Stenger makes the point that theologians flail away at finding a role for God without evidence, lacking sound epistemologies. The essay culminates with a grim assessment. In the section headed, Theocracy in America, Stenger describes the major damage under way in the United States because of the folly of faith—and he died before witnessing the current dreadful climate. We sometimes draw encouragement from the gradual increase of “nones” in the polls—the people who no longer claim religious affiliation. But forget the optimism. Stenger warns that evangelicals include those radical Christians who are committed to Dominionism; their mission is to eliminate the separation of church and state. By force of law they want Christian theocracy in the U.S. He offers a brief survey of authors who have documented the subversion of democracy by Christian fanatics, e.g., Michelle Goldberg, Chris Hedges, and Jeff Sharlet. But what does work as a result of faith? Well, the Vatican, Joel Osteen, Pat Robertson, and Franklin Graham haven’t done too badly. Perhaps we can acknowledge “all the good that Christians do.” Careful: might I suggest a balance sheet, subtracting from “all the good” all the colossal waste of time and money on church buildings, worship, and bureaucracy? And hoodwinking people into thinking they have to be religious to be and do good? What does it take to turn people off? “If science did not work, we wouldn’t do it,” Stenger points out. “Relying on faith, religion has brought us inquisitions, holy wars, intolerance, and antiscience. Religion does not work, but we still do it.” And the beat goes on. We are in a mess, thanks in large part to the folks who zealously trust in God.